Neither inside nor outside the law, street trials and popular justice have emerged as sites of social resistance to make visible the utter absence of an independent judiciary. From States of Impunity. 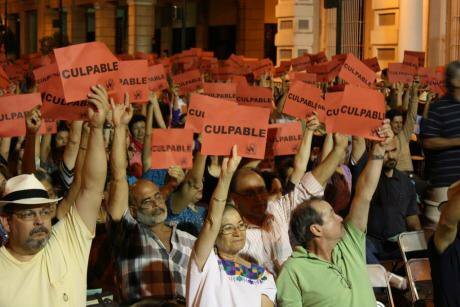 Guilty: a citizens trial in Sonora declares its verdict. Claudia Díaz Symonds. All rights reserved. In the 1990s, the trial of former President Carlos Salinas, “Juicio a Salnas”, was put on at the El Hábito bar in Mexico City. With the national flag and the sound of beating drums serving as the backdrop, a savage appeared on the dimly lit stage. In a shamanistic ritual the actor, wearing the hide of a beast on his shoulder, presented the audience with an effigy of the ex-president: a bald puppet with big ears, naked at first then masked, dressed in prison stripes and brought to trial for having tried to wipe out his entire tribe. The theatrical trial a form of social resistance that is straining the normative forces of political order in Mexico: the so-called popular or citizens’ trial. Its defining characteristic is the use of legal discourse genres–the courts and the law–to dramatize conflict. In just over a decade, these judicial spectacles have moved from the cabaret stage to the public arena. This brief satire of “transitional justice” actually has a dramatic contemporary echo. Last November an oversized effigy of Mexico’s current president, Enrique Peña Nieto, was burned at a demonstration in support of the 43 missing students of Ayotzinapa. Somewhere between these two symbolic executions lies the phenomenon of the street trial. Mexico has an abundance of trial-worthy cases involving accusations against former governors: in Jalisco, February 2007 on injustice and abuse of power; in Oaxaca, August 2007, on repression and human rights violations; and Nuevo León, September 2009, on rising violent crime and discretionary spending. In response to this, a certain form of social resistance has evolved into a theatre of cruelty, in which a display of ceremonial justice immediately results in a punitive sentence and is typified by conspicuously violent scenes and an impatient desire for justice. Virtual lynching is a frequent occurrence in the state of Mexico, public punishment is commonplace in Oaxaca and Guerrero, and in other areas, there are symbolic executions such as the burning of the effigies of public officials. The phenomenon of the mock trial is instead conducted in the public arena, a dramatization of the political conflict in which the desire for justice is reduced to legal language and forms. The typical scenario begins with the charges laid against the accused–a defendant in absentia–and then actors appear standing in for the opposing sides in the conflict. One is the counsel for the prosecution–a representative of the people or the citizenry–and the other is the counsel for the defense. Both litigate before a third actor, the judge, who will later pass sentence. Because the accused is absent, the punishment is not enforced, but neither is there any possibility of appeal. Popular or citizens’ mock trials represent a conflict. They promote the legal truth of the dramatic narrative in order to demand moral and political responsibility from the guilty party. The hierarchy is turned upside down: the public is now victim and jury. Moreover, the confrontational nature of the trial becomes a spectacle, a fight between truth and falsehood, transparency and secrecy, legality and legitimacy, reality and imagination. The mock trial is a critique of the justice system, of the rule of law, of lawfulness itself, and its drama reflects the struggle for accountability in Mexico. Insofar as it has comic elements, the mock trial is a cabaret act, but it is also a tragedy that restricts cathartic elements to accepted legal forms. These in turn predetermine the part the actors play and how the action unfolds. It is an intensely political exercise and a product of the desire for justice. The story is a horrific–a fire in which 49 children died and injured more than 70–and the emotional suffering of the case echoed across socioeconomic lines, challenging the legitimacy of state justice. The trial took place with the utmost solemnity. The tribunal was made up of journalists, academics, and artists, and in the dock sat the Mexican state. Beyond the sentimental impact that the case engendered though identification with the victims, it resonated profoundly because it drew a line between the state and a society wiped out by fire. In two decades we have gone from the comical cabaret to the epic tragedy of trials dramatized in the public square. In Mexico, there is scant legislation ensuring public accountability; therein lies the power of state authority in all its misery and grandeur. Impeachment plays an important role in partisan battles, but primarily as tool for scandalmongering, since it carries no legal weight and its crimes are neither investigated nor prosecuted. As an instrument of constitutional control, it operates with all the friction of a politically mediated administrative act, triggering party discipline, loyalties and ideological affinity. There is no punishment or sanction, and victims are not compensated. Sometimes other legal remedies are sought through special prosecutors and commissions that only neutralize potential political impact. A few cases are heard before international authorities such as the Inter-American Commission on Human Rights or the International Criminal Court (ICC), but ultimately they are destined for oblivion, as with attempts to try former president Ernesto Zedillo for the Acteal massacre in 1997 before a US a court, and an attempt to try former president Felipe Calderón before the ICC for war crimes and crimes against humanity. Take for example the case of Carlos Romero Deschamps from Tamaulipas, a union leader and three-term congressman,who is the subject of 37 judicial inquiries, three arrest warrants and one arraignment, has various court cases pending, and still he has managed to become a senator for the second time. What we have in Mexico is a thirst for justice in a system that is wholly inequitable and violent. The framework governing political parties and the electoral system is in fact relatively strong, but paradoxically it is this mechanism that the political class exploits with astonishing impunity. The dramatic manifestation of the public thirst for justice is the mock trial. These public judicial proceedings are not lynchings, although they are suggestive of the scapegoat phenomenon, as described by René Girard. There are no ropes, sticks, stones or fire; this is not public retribution. It is a form of popular justice mediated by a choreographed court, with a raised stage, table and chairs, where there is a physical divide between those who are in front of and those who are in the court room, a mediation between the general public or citizenry and the accused, the adversary, the enemy. But neither is it due legal process. The judge is no way neutral; the accused has neither a voice nor a defense–it is theatre. In the aforementioned cases–the mock trials of the governors of Jalisco, Oaxaca and Nuevo León or of the officials from Sonora and Jalisco–a vacant chair was used to signify the accused’s absence. The prosecutor argued the people’s case represented the victims, gave them a legal voice, delivered a compelling argument, and tried to move, convince and persuade. He provided an intelligible account of a conflict that the public, informed by media reports, was already more or less aware of. The story drew its dramatic force from the legal discourse operating in the courtroom scene. The hypothesis or plot made use of actual events to modernize a kind of anti-political mythology–hostile to both politics and politicians–and its rancorous, resentful imagery reflected the unquenched thirst for justice. The prosecutor’s narrative addressed the audience, appealed to its sentimentality, captured its attention, played on its interest in moral conflict, and secured its political commitment. A public defendant then tried to redress the balance, pleading the innocence of the accused and citing attenuating factors. It was a brief show of resistance, farcical, awkward and mostly useless because at the end of the trial, the judge called for the mock verdict–deus ex machina, poetic justice–and declared the guilt of the accused, condemning him to an acceptable sentence. Applause. At the climax of the spectacle, the rapt public witnesses a cosmic struggle between the forces of light and dark, good and evil, with tangible effects. It is true that the accused is absent, but they are identified, and not just as a demonized person but also as a high-ranking member of the state apparatus and as a politician. They represent a function, a state institution, an entire political class, and the party in power. This is why, in some cases, the empty prisoner’s dock is filled with the mythical figure of the state as a humiliated beast, vanquished and absent. Faced with its ominous silence, civil society, the citizenry, the people rise up triumphantly–a community banding together against injustice and, forged by a shared emotional recognition that in this jurisdictional act, it can reclaim sovereign power over and against the state. The variations of these theatrical events are noteworthy, and one important peculiarity is the makeup of the public itself, in other words, the classes which are included and which are left out. In Guadalajara in 2007, different organizations convened an assembly in the city’s Plaza de Armas and voted to form the “People of Jalisco’s Popular Tribunal” to judge the state’s ex-governor. But in Monterrey 2009, a moral and ethical appellate court was convened by invitation in the auditorium of a business center to indict the former governor of Nuevo León. One was a trial open to the general public, complete with police harassment; the other was a paid, ticket-holders-only gala for select participants. One was comprised of popular representatives; the other, of citizens exercising their rights, but who also happened to be members of the local elite. In the former the actors wore a cap and gown, the accoutrements of a real courtroom; the latter supplied participants with a collapsible table, a loudspeaker and placards. The kinds of social mediation undertaken vary, as do their limitations. From the point of view of state authorities, the mock trials are always a farce, as was expressed in Mérida in 2011 immediately following the case of the “Civic Family Front” versus the ex-governor of Yucatán. But what is at stake is truth–formal legal truth. The trial is a means of identifying it, while the theater–or at least a particular notion of dramatic art–tries to represent that legal truth and submit it to the critical judgment of the people. It is an illusion that creates a free space for discussion about the accountability of politicians and state officials, an arena configured by the flow of legal discourse, the historical experience of conflict, and the appearance of lawfully overcoming a political crisis. The justice system is totally devoid of theatricality because it does not take place in public. It tends to be bureaucratic and secretarial. Written judgments accumulate with the heft of paper bricks. Legal language is gibberish to the uninitiated; its foundation is metaphysical, ambiguous. Judicial process is agonizingly slow and suspenseful, its inner workings a silent and incomprehensible mystery. Outside of the Supreme Court’s sessions, which have been televised since 2005, most Mexican justice appears scandalous when put under public scrutiny. This was evident with the broadcast of the 2011 documentary “Presunto culpable” (Presumed Guilty). The documentary opened up the black box of criminal proceedings with no theatrics other than the cruelty of bureaucratic, dispassionate, and perfunctory injustice. It showed the dark side of police behaviour, the Federal Public Ministry, the witnesses and counsel for the defense, the evaluation of evidence, and the treatment of those charged without regard for presumption of innocence or wrongful incarceration. The most recent judicial reforms in 2008 and 2014 began to transform the justice system from an inquisitorial written one to an accusatory oral one, more properly theatrical by virtue of its adversarial structure. Oral trials facilitate greater public visibility and transparency, strengthening the legal form through dialogue–the debate between actors, their war of words, the chorus of witnesses and experts, including the press, all under the watchful eye of the public as supervisory body. Adoption of the oral trial, whether for criminal cases or civil suits, is sure to transform the experience and expectations of the justice system in Mexico. Until then, mock trials performed in the public arena will still have merit because of their capacity to render the invisible power of judges visible, an almost revolutionary change. Judicial dramatizations accelerate the critical timeframe of political conflict, the uncertain, indeterminate and preliminary transition from the time before to the one after, from what was to what will be. It is not that the actors find themselves before the law, as in Kafka’s parable, nor outside the law. Rather in these dramas, there is an authentic, living law with sovereign, jurisdictional authority to decide what is just and unjust. The staging reaches its high points, first with the grievance and then with the sentencing. Among the factors that may technically contribute to the crisis, the most interesting are those that emphasize the guilt of the accused, irrespective of immunity, privilege or even the nature of responsibility (political, administrative or criminal). These ensure the desired sentence is obtained, one that clearly draws the line between lawlessness and the law, between the legality with which the justice system operates and popular or citizen legitimacy. The original version of this article can be found in Spanish. It was translated to English by Victoria E. Robertson.